STOP 1: Blue Cut, San Bernardino County (34.2668 N lat, 117.4593 W long.) From your departure point on Friday morning, you will arrive for a 9:00 a.m. check-in at a historical location, named Blue Cut by early travelers who crossed Cajon Pass in the 1800s. There is a commemorative monument there. Your road log for the trip will be distributed here along with your gift. Coffee and light breakfast snacks will be provided. Here, Monte Marshall and Mario Caputo will highlight the tectonic setting for the Pelona-Orocopia-Rand Schist and the control of landscape by the San Andreas fault system. STOP 2: Lost Lake, San Bernardino County (34.2721 N lat., 117.4661 W long.) We will drive about 2.0 miles to Lost Lake, a sag pond, which is a transtensional feature created by movement along the San Andreas fault in Lone Pine Valley. STOP 3: Mojave River, Victorville (34.5342 N lat., 117.2870 W long.) We will head north for about 20 miles to Victorville to see an area where the mainly subsurface Mojave River flows above ground through the town of Victorville. STOP 4: Mojave River Valley Museum, Barstow (LUNCH STOP) (34.8879 N lat., 117.0234 W long.) Our lunch stop in Barstow includes a break to explore the local Mojave River Valley Museum. It has a great exhibit regarding mining and native peoples of the area. A local park is located across the street to enjoy a break in the travel. LUNCH WILL NOT BE PROVIDED. Please bring food or purchase food from a local business. STOP 5: Mojave River Wash, Barstow (34.9071 N lat., 117.0223 W long.) A short trip will take us to the dry bed of the Mojave River just north of downtown Barstow. Mario Caputo and Monte Marshall will prompt a discussion on the history and composition of this geologic feature. STOP 6: Owl Canyon Campground (35.0220 N lat., 117.0212 W long.) Our final stop for the day and base camp will be at Owl Canyon Campground located about 9 miles north of Barstow. We will have camping spots reserved already and you'll have time to set up camp and relax before dinner. On the menu, MINESTRONE SOUP AND CHICKEN PENNE ALFREDO PASTA with VEGETABLES AND FRENCH BREAD. STOP 7: Owl Canyon Campground (35.0220 N lat., 117.0212 W long.) Awaken to a campground full of great geologic views and a full breakfast of EGGS, PANCAKES, SAUSAGE, CEREAL, FRUIT, COFFEE, JUICE, and MILK. Be sure to make your lunch for the day, by building your own lunch of a SANDWICH, CHIPS, FRUIT and COOKIES. STOP 8: Owl Canyon Hike (35.0220 N lat., 117.0212 W long.) We will make our way to Owl Canyon at the north end of the campground after breakfast. Guided by Mario Caputo and Monte Marshall, a short hike up Owl Canyon will help reveal the sedimentologic and structural setting. The hike is relatively flat but has uneven terrain as we will be hiking through a wash. (Round Trip 0.75 miles). The hike will take most of the morning and we will head out of the canyon and have lunch. STOP 9 Rainbow Basin Hike (35.0313 N lat., 117.0336 W long.) Carpool and head into Rainbow Basin National Natural Landmark, a few miles to the west, and park in the central dirt lot. We will embark on another short hike to see more outcrops of stratigraphic markers in the syncline and get a spectacular view of the overall syncline in profile (round Trip 1.1 miles). We can spend as much time as we need in the Basin and head back to camp for dinner and drinks! The dinner menu for Saturday consists of hors d'oeuvres of VEGGIES, CHIPS and SALSA, a 2nd course of MIXED GRILLED SAUSAGE and a DINNER OF TRI-TIP, BEANS, GARLIC BREAD and SALAD. Reveille at 7:30 a.m. for a breakfast of BURRITOS, HOT/COLD CEREAL and FRUIT. Pack up camp and be sure to make your lunch for the day by building your own lunch of a SANDWICH, CHIPS, FRUIT and COOKIES. STOP 10: Calico Ghost Town (34.9431 N lat., 116.8664 W long.) From Owl Canyon campground, head out to Calico Ghost Town and observe great soft sediment deformation and stunning folds. Explore the historic ghost town and learn about old mining history in the area. This stop completes our 2018 Field Trip! I would like to extend my heartfelt thanks to everyone involved with the 2018 Field Trip. 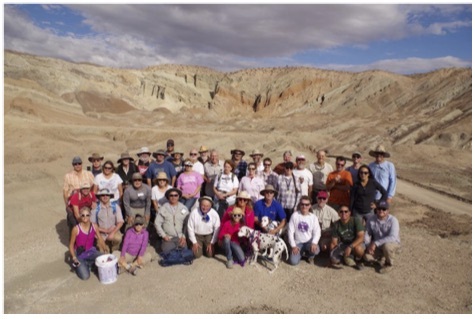 We had about 50 people come along and explore the geology of the Mojave Desert. This trip was almost 11 months in the making and it went off without a hitch (maybe a little rain). Thank you to my trip co-leaders Dr. Mario Caputo and Dr. Monte Marshall who's endless geologic knowledge surely made this trip infinitely more interesting than I could have on my own. Dr. Norrie Robbins who unfortunately couldn't make the trip (feel better soon!) but provided great insight into the human history of the Mojave. Thanks to Brian Papurello and crew for setting up the camp kitchen and keeping our bellies full. A big thanks to the SDAG officers, Chris Livesey, Adam Avakian and Heather Reynolds who have been such great help before and during the trip. As always, Diane and Monte Murbach provided the Hawaiian theme and margarita drinks each evening so thanks to them and SDGS board members. Geocon, my employer was gracious enough to provide the beer kegs which kept people more than happy. And thanks to everyone who came on the trip to make it so special! We are working on preparing the volume for the trip, hopefully to be published in 2019. It has been a humbling experience and I thank everyone for their kind words on their enjoyment of the trip. Can't wait to see what our 2019 VP Adam Avakian has in store for us next year. Keep exploring and see you out there!